After finishing our walk round Osaka Castle, we started back on our way to the hotel. Just outside Osaka Castle Park, before we got to the train station, I took a photo of the NHK Osaka (NHK 大阪放送局) (on the right) and Osaka Museum of History (大阪歴史博物館) (on the left). 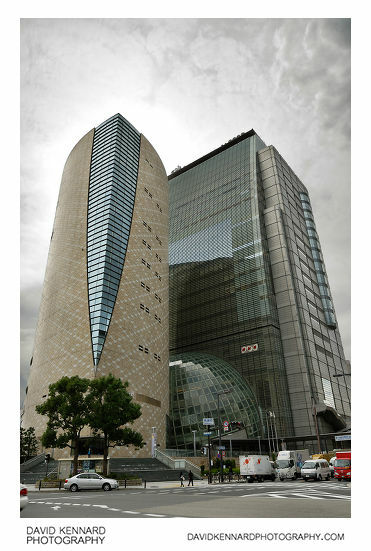 Although the two buildings are separate, they were constructed together as a single project, which was completed in 2001. After getting back to the hotel and collecting our things, which we'd stored at reception, we headed to Osaka station to get a train to Kyoto. 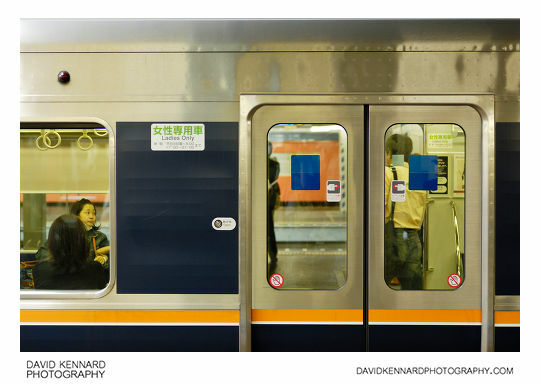 In Japan they have ladies only carriages during certain times. At the time we caught the train the restrictions weren't in force, so a man was queuing with us and I took a photo of his shoe with the ladies only notice on the floor. And this is a ladies only carriage during the time when men are allowed to use it. (It's the same as a normal carriage but with ladies only stickers, they don't paint it pink or anything 🙂 ). 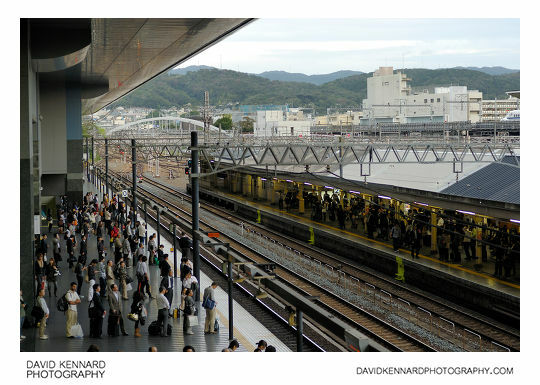 After catching the train to Kyoto and arriving there, I took a photo looking down from the steps from the platform. 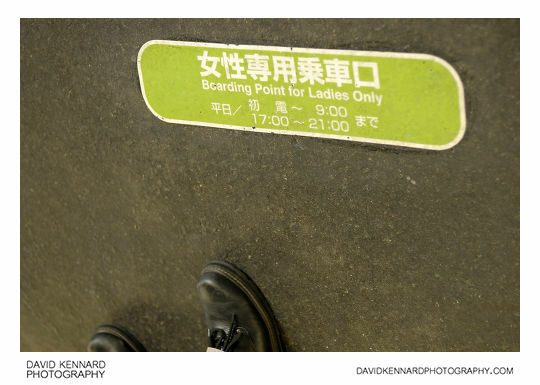 You can see that in Japan there are specific boarding points marked on the platforms where people can line up. Then the train driver has to park the train carefully so as to line up the doors with the boarding points. In the UK we all just hang around anywhere on the platform until the train pulls up and the train driver doesn't have to be too careful about parking. Kyoto Station (京都駅; Kyōto-eki) is a very large modern building. 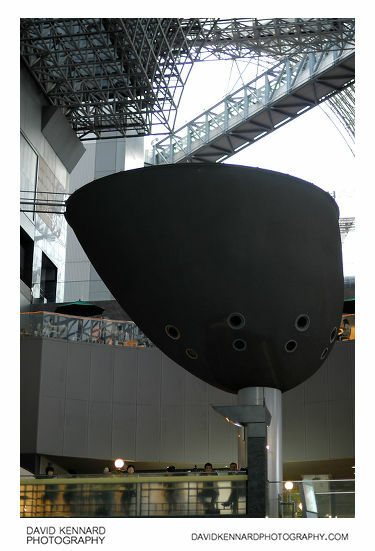 It was designed by the Japanese architect Hara Hiroshi (原 広司), and opened in 1997. I didn't take many photos of it at this time since we needed to find a hotel for the night. 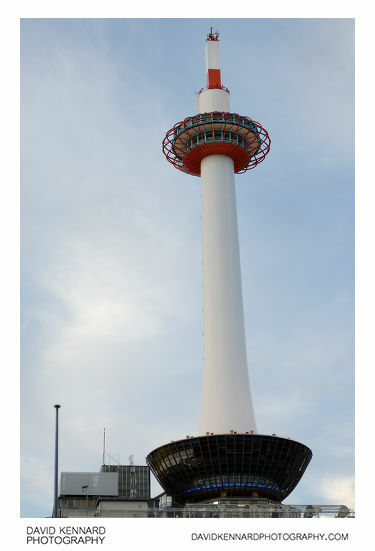 Just outside the station is the large Kyoto Tower (京都タワー; Kyōto-tawā), which is 131m tall, the tallest building in Kyoto. After leaving the station we trekked around for ages trying to find a hotel that wasn't fully booked. Eventually we did find one, but they only had a room available for one night. Since it hadn't been particularly easy to find a reasonably priced hotel in Osaka either, we spent the evening on one of the hotel's computers deciding where to travel to next and booking the hotels for the rest of the week online. 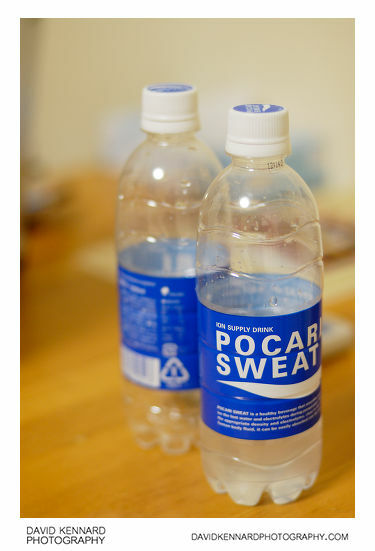 This is a couple of nearly empty Pocari Sweat bottles in our hotel room. It's the only type of sweat I like drinking, and we had quite a few bottles / cans of it during our holiday.